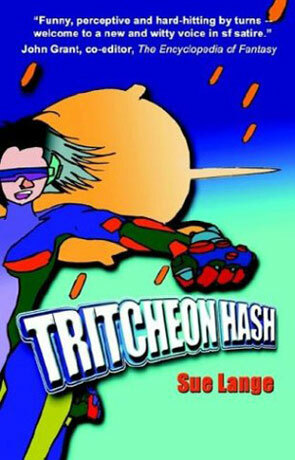 Tritcheon Hash is a science fiction novel by Sue Lange. The first thought that popped into my head after having read a couple of pages of T. Hash was; “What? Lesbian Science Fiction?”. After at few chapters it's clear that it isn't and after having finished it, I'm not even sure that it qualifies as feminist SciFic. It's probably satire, but who can tell these days ("would you like some sarcasm with that satire?"). A couple of years in the future the females gets really, really tired of the males, who hasn't gotten better at taking out the garbage or the toilet-seat thing, so they pack their collective bags and leave en mass to a new planet. Lots later the only contact, between the two planets is the yearly swap-meet, where the females bring any baby boys born since last and the males bring a couple of bags of sperm (artificial sperm doesn't seem to work, and cloning doesn't seem to be an option). Most of T. Hash takes place on the female planet, and Lange has some good fun, at the expense of her future sisters (she gets around to the males later). Nothing revolutionary or offensive, but lots of fun. I especially liked the part about nearly everything on the male planet being made of meat products. Most of it makes very little sense or is highly illogical, but it is funny and that's the important thing in this book. The only problem I had with Langes future was that most of it seemed like Los Angeles with rockets. It's probably what Lange wanted, but sometimes it gets a bit to much. Anyway, the story, which isn't terribly important, is that the main character, Trish, has to go on a secret mission to earth to find out what the males are up to. So the first half of the book is the set up for the mission, on the female planet and the last half is the mission on Earth. Well written and entertaining, if a bit over the top at times. Very soft in the science parts. Written on 21st March 2004 by TC.